All of you know how much I love creating new pop tab bracelet designs as well as selling and gifting them. 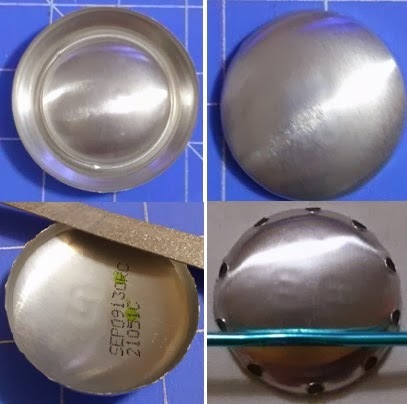 I recently realized that all this time I've been overlooking another part of the soda can that is just as beautiful - the bottom. And this is what prompted me to design this cute little bracelet that takes absolutely no time at all to make. My husband doesn't find this funny but I do - as I'm hosting a yard sale to get rid of clothes that I've been holding on to since my kids moved into their own homes, a neighbor brought over a box of old t-shirts. She asked if I could craft with these. Who was I to turn her away. As I was sorting through each one, I could see they were bad enough not to wear at least out in public, but not bad enough to turn into rags. This box definitely had t-shirt yarn potential. 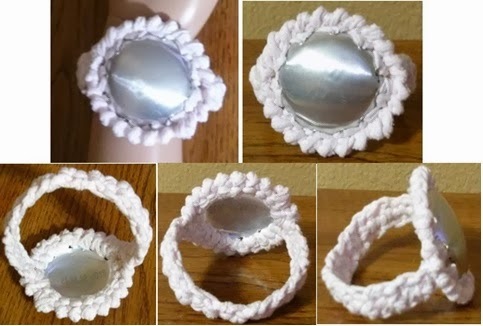 I've designed so many plastic yarn (plarn) bracelets decided to design one with t-shirt yarn (tarn). 1 T-shirt cut into yarn - 1/2" strip width. My continuous strip tutorial for plastic yarn is the same way I make t-shirt yarn. Crochet Hook: You'll need a hook small enough to go through the holes and pull the tarn through. I used an F hook. 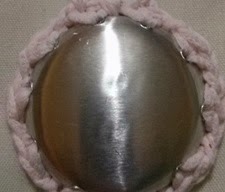 Pic 1: Remove the bottom off of a soda can and trim around removing the sides. Pic 2: As you can see, we're using just the inside hump. Pic 3: Using a nail file, it's just one that I picked up from Dollar Tree, file away any roughness. Even though the t-shirt yarn covers this edging, I just like to have nice smooth edges. Pic 4: With your pencil, make 10 marks around for even spacing between holes. The easiest way I found was to first punch the 2 holes on each side for the band. Making sure the band was even across was more important to me (which is why you see the crochet hook in the picture). Then I punched 3 holes on top and on the bottom. Designer Tip: You'll start making the band after you finish crocheting around the piece so you want to end in the hole where you want the band to be. 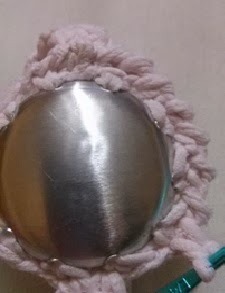 1: Join tarn with a slip stitch, chain 1 and make 2 single crochets in the next hole, chain 1. 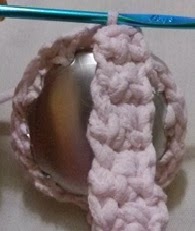 2: It's always a good idea to work in your tail as you crochet to avoid weaving in later. This pic shows how I did it. 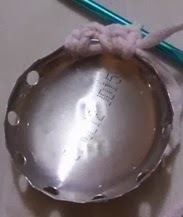 3: Repeat around making 2 single crochet stitches in each hole with a chain in between until you get back to the starting hole which you will make 1 more single crochet. Then slip stitch in 1st single crochet to complete round. Chain 1 and turn. Designer tip: How wide you want to make the band is really your own preference. 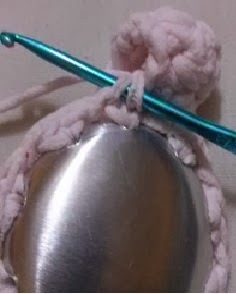 4: Single crochet in same stitch and in the next stitch making the band 2 single crochet stitches wide. Crochet about 14 rows, give or take. Remember it's t-shirt yarn so there will be some stretch. Then do a fitting. 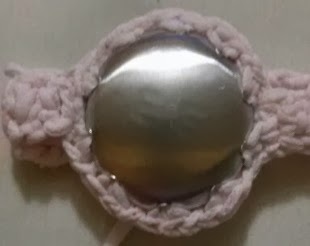 6: Once you have reached a desired length, slip stitch or whip stitch the end of the bracelet to the other side of the piece making sure the bands are even across. 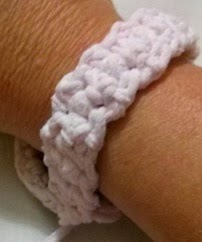 7: With top of bracelet facing you, join with a slip stitch to any single crochet stitch made around the piece. 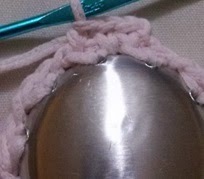 8: Reverse single crochet around. Join with a slip stitch to beginning reverse single crochet then complete by weaving in any ends. Be adventurous and try making one in 2-colors ...for example, the reverse single crochet in a different color. Let me know if you have any questions with this pattern.